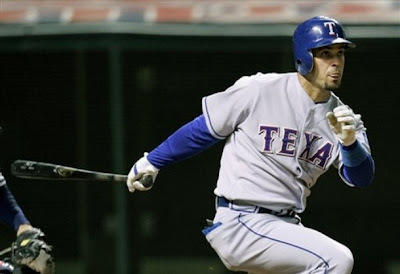 David Murphy is expected to open the 2009 season as the starting left fielder for the Texas Rangers. Yet in AL-only leagues he has an ADP of just 209.69 behind odd choices such as Andruw Jones, George Kottaras, Daric Barton, and Melky Cabrera. The Rangers expect Murphy to set a career high in at-bats as Club President Nolan Ryan thinks he should be left in the lineup everyday to achieve his full potential. What is that potential? Murphy should draw more walks and his plate discipline still has room for growth. However, he is a good contact hitter with plenty of power. He hits too many groundballs which limits his homerun potential to about 25 in a full season (without a major adjustment). He should hit for a solid average in the .280-.290 range. Murphy will bat in the middle of a loaded lineup which boads well for his Runs and RBI potential. At his present draft position Murphy makes a great bargain selection in the later rounds of AL-only and even deeper mixed league drafts.